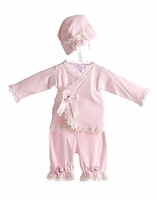 Home > Baby Biscotti - New Born - Take me home-Christening Gowns > Baby Biscotti- New Born - Take me home -Girls > Katie Rose - *Paula* Baby top and Bloomer - 2PC Set & Matching Hat - Made in USA! 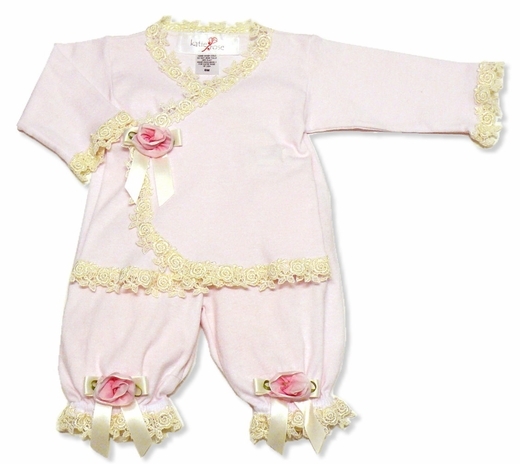 Katie Rose- 2pc set-Baby Wrap is enhanced with satin roses and lovely trim. MADE IN USA! Fabric Content; 100% Cotton Matching Hat sold seperatly - only with purchase-add below!